International students continue to rate highly their experience at Newcastle University, an international student survey has revealed. Conducted by i-graduate, the International Student Barometer Autumn 2017 results demonstrate a high level of satisfaction among students from around the world, with 93% of respondents stating they were satisfied with the University overall. This response rate places Newcastle University 6th in the UK, out of 31 participating institutions. 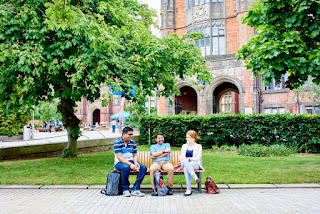 Anshuma Sharma, a postgraduate Media and Public Relations student from India, said: "Situated in gorgeous Northeast England, Newcastle is known for its natural beauty and rich heritage. The city also has a lower cost of living. You couldn’t ask for better quality teaching. The city balances community and connections. I feel quite lucky to be a part of a world famous university that feels like home."